Harpeth River State Park, Mound Bottom Site. The platform mound is in the background. 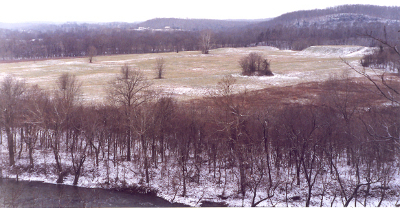 Mound Bottom is a large Mississippian Period town and ceremonial site located on the Harpeth River in Cheatham County, Tennessee. The town is probably more than a thousand years old, estimated to have been populated between around 900 AD and 1300 AD based on radio carbon dating. It's owned by the state and is a unit of Harpeth River State Park. The Eastern Face of the Mound Bottom Platform Mound. 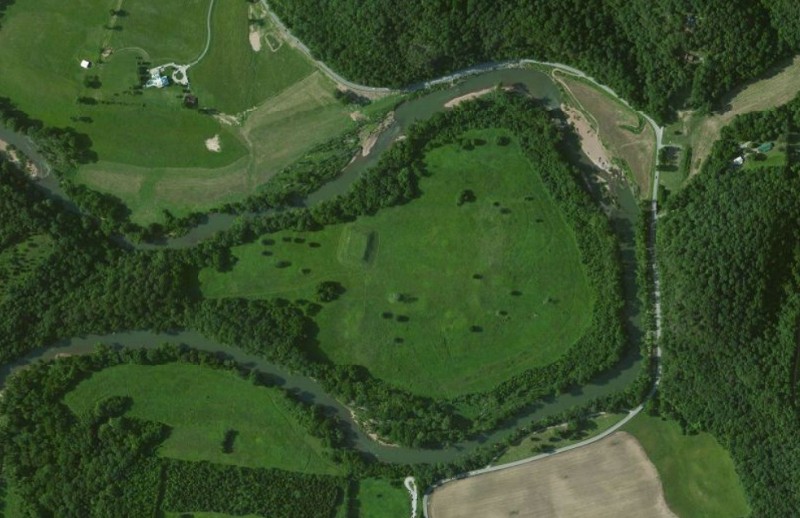 The site contains 14 mounds surrounding a plaza area, including a large platform mound. This mound probably supported the house of the town leader and/or a town house or temple used for civic or religious purposes. Results of archaeological excavations conducted in 1926 indicate that all of the mounds around the plaza supported some type of buildings, possibly the homes of town officials. Most of the people lived in houses arranged in rows outside the mounds around the plaza. The town was enclosed on the north, east, and south sides by a wooden palisade. The Mound Bottom Plaza Area After A Light Snow. Platform Mound Is At Center Right. Mound Bottom was probably a part of a larger civic/ceremonial center. To the south about a mile away lies the Pack Site, 4 times larger than Mound Bottom, located on private property. Strong evidence suggests the two sites were contemporary, although the last archaeological work conducted on the Pack Site was done before radio carbon dating so the evidence isn't conclusive. Mound Bottom, Aerial View. The platform mound is just left of center, east is to the right. 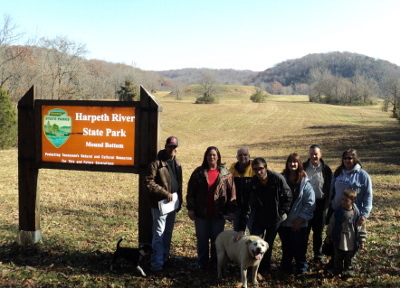 The Mound Bottom site is only accessible to the public through hikes led by Harpeth River State Park rangers. Currently the park is offering free hikes every Sunday. 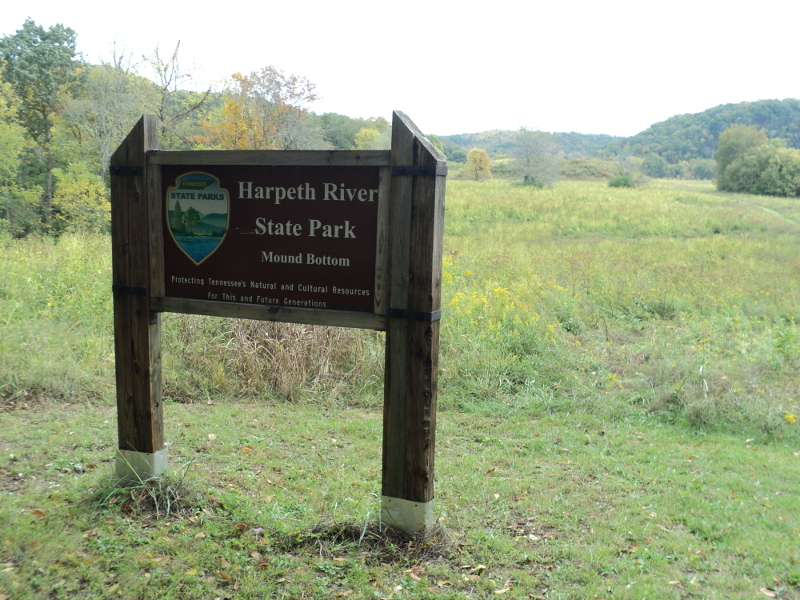 Registration is required - see the Harpeth River State Park Events page for more info. There are no interpretive facilities at the site, although the park plans on adding a display to a kiosk the Gossett Tract, located across the river from Mound Bottom. 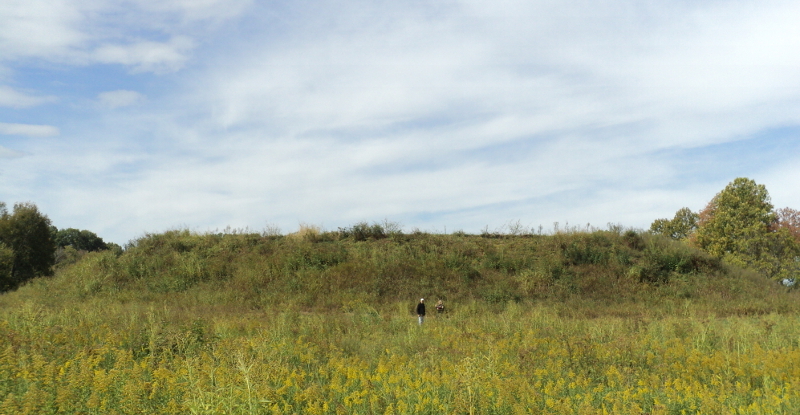 The Native History Association lead a tour of the Mound Bottom Site on November 17, 2012. From left to right in the photo are Native History Association President Pat Cummins, Mackenzie Sutton, Greg, Noah, and Lisaann Gittner, Park Ranger Bill Morton, and Sandra and Andrew Ellis. The dogs didn't make reservations but we let them join us anyway. Mound Bottom by Kevin E. Smith, Tennessee Encyclopedia of History and Culture, Version 2.0. Mound Bottom Articles by Kevin Markuson (the source for our facts above), published in The Advocate newspaper. The 1974-75 Excavations At Mound Bottom, A Palisaded Mississippian Center in Cheatham County, Tennessee Southeastern Archaeology article by Michael J. O'Brien and Karl Kuttruff. Mound Bottom State Archaeological Area web site. Harpeth River State Park brochure in pdf format. Harpeth River State Park directions and contact info.